This tender honey buttermilk bread recipe will be your new go-to yeast bread. It rises beautifully thanks to the bread flour and the honey adds a slight country sweetness. 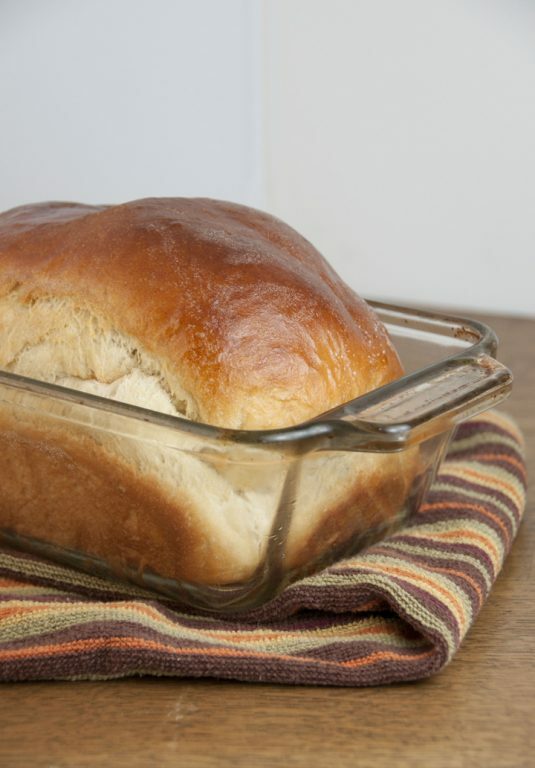 Homemade bread is one of those foods I love to tackle and I love this honey buttermilk bread. I learned over the few years that I have been cooking and baking that yeast bread is one of the easiest things to make, it’s made with items that most people always have in their pantry, and yet always impresses people. It’s that extra step you take when you are making a homemade meal and your guests can never believe you also made your own bread. It’s a good feeling! It is simple to just pay a couple dollars and pick up a loaf at the store to have along with your dinner, but I find it’s one of those things that is worth the little bit of extra effort. I’ve learned over the years – and am still learning- what is worth it and what is not. The only catch with homemade bread, of course, is that you need to plan ahead a little when it comes to yeast bread to allow for the time it takes for the dough to rise, etc. Other than that, piece of “cake”. This soft buttermilk bread is a white bread that has the perfect amount of sweetness added to it with the subtle flavor of honey. I find this recipe works best using pure raw honey but you can use whatever you have on hand. Buttermilk bread has always been one of my favorites as far as both taste and texture go. The buttermilk just gives it the perfect texture and lightness – you must try it sometime. Note: this recipe makes two large loaves, so divide it in half if you don’t need that much! Or freeze the dough and have it on hand when you want to have a taste of this deliciousness again in the near future. This tender buttermilk bread recipe will be your new go-to yeast bread. It rises beautifully thanks to the bread flour and the honey adds a slight country sweetness. What an absolutely gorgeous loaf. Buttermilk is a favorite in our house, and yours looks so fluffy! I just want to cut a couple of slices and toast them for breakfast. Drooool. That loaf looks so perfect — I can practically taste it! What a beautiful loaf of bread, Ashley! I bet this would make a killer french toast (stuffed with Nutella, of course)! Oh bread, how I love thee. I can’t wait to try this, Ashely, looks amazing! Bread is totally my BFF. I’m loving the ginger and buttermilk in this recipe. I’ll be trying it soon. Hi! I have a question, the ginger used in this recipe is directly from the root? Or powder? It’s the powder/ground ginger. Sorry about that! It’s been way too long since I baked some bread and this loaf is gorgeous! Oh, gosh! I love homemade bread and this sounds terrific! Oh my goodness what a beautiful load of bread. Incredible how the buttermilk adds that tenderness and makes the crumb so delicate! Beautiful loaf! 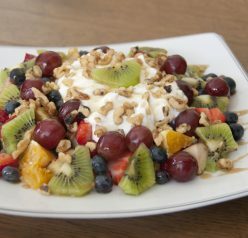 Love the combination of honey and buttermilk! It’s so pretty! I’ll be making one for me and one for mom! Wow! Your bread looks so fantastic. I’ve never heard of the ginger trick to help start the yeast. So cool! Looks delish but what kind of yeast did you use? Ashley this bread is GORGEOUS!!! 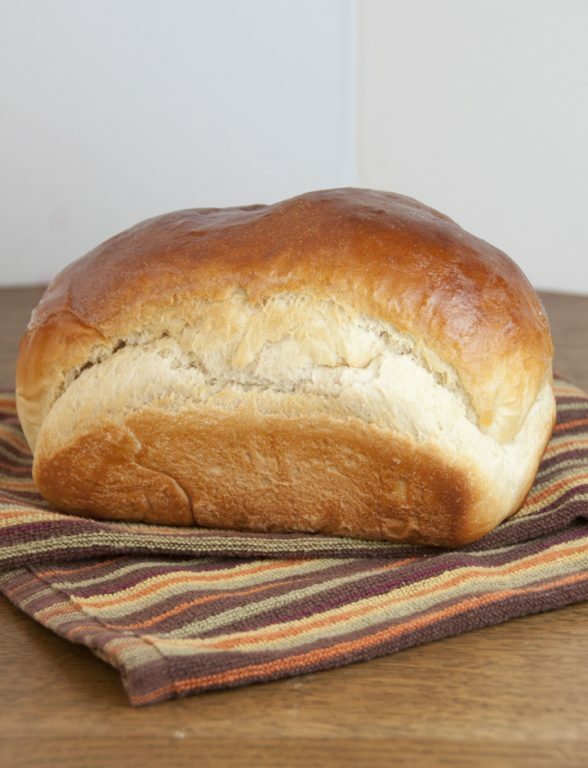 Home made bread is simply wonderful and Ashley – girl – look at your light and fluffy loaf!! I love the smell of baking bread in my kitchen. Golden and beautiful! Making your own bread is a good feeling (for me, it’s a great feeling)and it does impress guests or family and friends:)Your loaf is so perfect! You should join our #TwelveLoaves baking group…it’s so much fun!! Baking bread in my kitchen has always been my favorite thing to make. Your loaf looks stunning and I love that you added ginger to feed the yeast. I’ve never tried that but I really love the idea! Homemade Bread is definitely worth it! This looks to die for, WOW! Pinned! Oh boy, I love this. The bread looks so soft and tender! 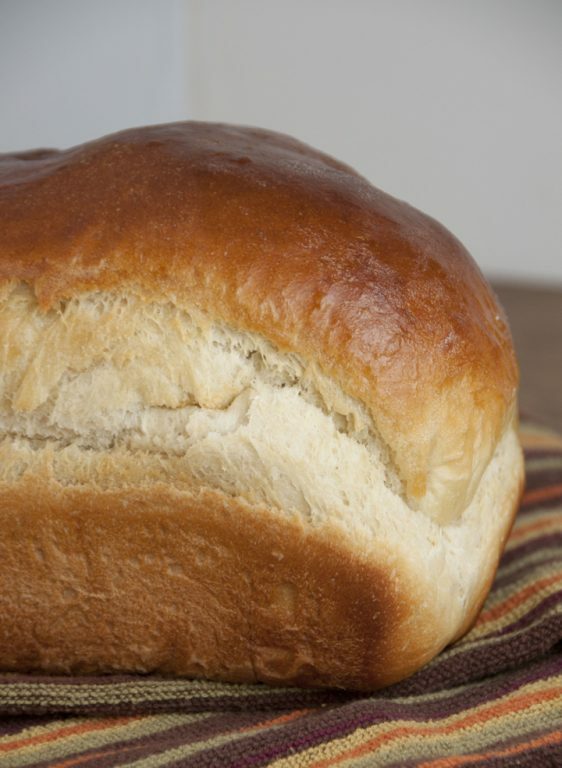 I have never made/had homemade bread made with buttermilk; it’s got to be so good!! 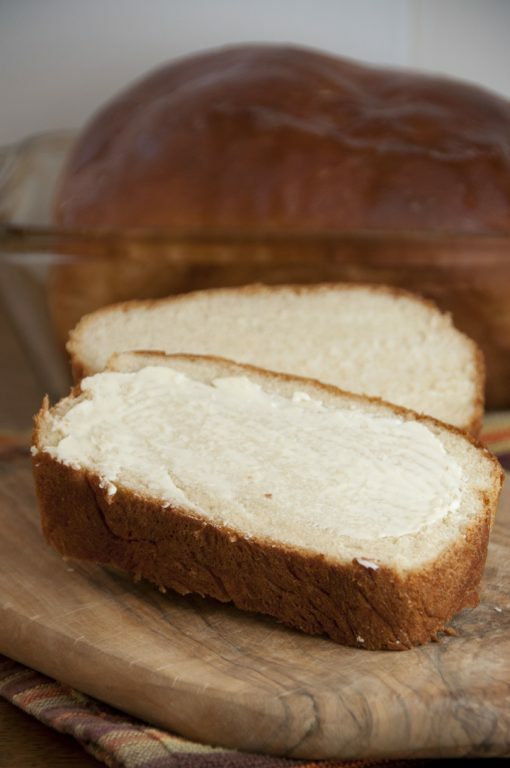 I think homemade bread is the most beautiful thing….I love the combination of honey and buttermilk here. Pinning! Thanks for the pin, Kellie! Bread is my biggest downfall, especially when it’s homemade! I can almost smell this, and I’d love a giant slice! Lovely recipe! I like that ‘pinch of ginger’! Ashley, I swear I can smell it. This looks so good. I’m such a sucker for fresh bread. It has to be hot out of the oven and I will devour it. With loads of butter. Can you use ordinary flour or does it have to be bread flour? Bread flour rises better, but all purpose flour can be used.. I just doubt it would rise as high as it should! Have you tried gluten free flour with this recipe? I have not. I’m sorry! can I half the recipe to make one loaf? 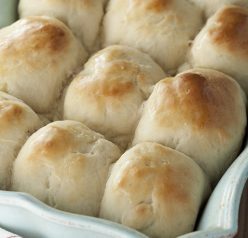 Have you tried making dinner rolls with this dough? 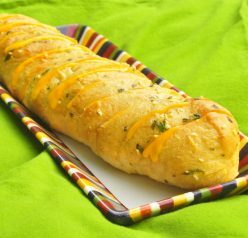 Could this recipe work in a bread machine? I have never done it, but I don’t see why not! Just follow the instructions for your machine. Thanks, Joy! What kind of ginger? Fresh? ground ginger 🙂 Sorry for not specifying. Can you please provide the nutritional breakdown, as I am prediabetic. I’m so sorry but I don’t know that information 🙁 I know there are apps where you can type in all the ingredients and it will provide that info. Sorry I couldn’t be of more help! If you freeze half the dough, at what point do you freeze it? After the last rise? Or before? I see all the comments but none from those who made it with any post baked comments. Love the tip about the ginger. As long as I’ve been making bread, I did not know this. Question: If you wanted to use whole wheat flour, what would be the changes in the flour quantities? What size pans do you use?? 8×5 or larger? I want to make it!! I wonder if this recipe would work in a bread machine? Can this be made w gluten free flour? I have never tried it with gluten-free flour before, but if you use something like cup for cup flour I don’t see why it can’t work! Can I use this recipe in my bread machine? Yes I don’t see why not. Although I’ve never tried it before since I don’t have a machine. AshleyI just made your honeybuttermilk bread. Gorgeous.looks great and tastes yummy! used all purpose flour and mistook 1/4 cup of butter for one stick of butter so i guess its sort of a brioche loaf. but it shure is good. This recipe is fantastic. It is my husband’s new favorite bread. I’ve made it twice now. Has really good shelf life too (if my husband doesn’t devour it in two days LOL). I plan to use my stand mixer to make this, do you think kneading with the dough hook would work?